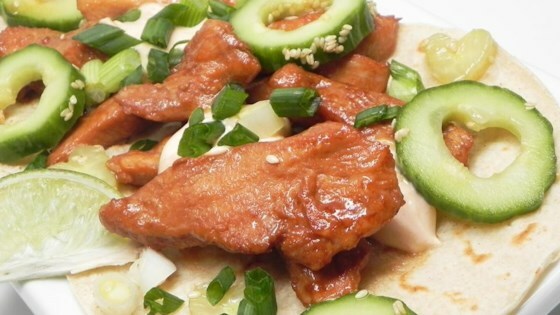 "This recipe for chicken teriyaki tacos is like a symphony of flavors: savory and incredibly crispy chicken smothered in a rich teriyaki sauce, topped with a tangy Japanese cucumber salad, scallions, and spicy sriracha sour cream." Place cucumber slices in a colander in the sink. Sprinkle salt on top and toss to coat. Allow to sit for 20 minutes. Rinse cucumber slices very well with cold water; drain. Mix rice vinegar, 1 tablespoon soy sauce, 2 teaspoons sugar, and sesame oil together in a bowl. Add cucumber slices and sesame seeds. Toss gently and transfer to the refrigerator. Whisk 3 tablespoons soy sauce, mirin, sake, and 2 tablespoons sugar in a small bowl to make teriyaki sauce. Heat oil in a large skillet over medium-high heat. Prick chicken skin all over with a fork; place skin-side down in the hot oil. Cook until the skin is golden brown, about 12 minutes. Flip and continue cooking until second side is browned, about 7 minutes. Reduce heat to medium; pour teriyaki sauce over chicken. Cook until sauce thickens, about 2 minutes. Remove from heat. Cover and let rest for 5 minutes. Slice chicken into strips and place in a bowl; add teriyaki sauce from the skillet and toss to coat. Toast corn tortillas in a large, dry skillet over medium-high heat until crisp and slightly blackened around the edges, 1 to 2 minutes per side. Wrap in a dish towel to keep warm. Mix sour cream and sriracha sauce together in a small bowl. Divide teriyaki chicken among tortillas. Drizzle sour cream-sriracha mixture over chicken. Top with cucumber salad, scallions, and black sesame seeds. Tangy, crispy, spicy and sweet Japanese tacos! You can prepare the Japanese cucumber salad the night before for faster prep. If you can't find Japanese or Persian cucumbers, you can substitute 1 large English cucumber. It will need to be seeded and cut into half moons. Nutrition data for this recipe includes the full amount of kosher salt. The actual amount of salt consumed will vary.